If you are new to swimming, try swimming vocabulary first. Why do a specific ‘workout’? No matter how motivated you are, whether to be healthier, swim faster or longer, put off or prevent the diabetes or hypertension that runs in your family, or pass a prerequisite test for a sport or program, you are human. As a human you get bored or you can have trouble staying motivated. A swim workout can start with the full intention of swimming more or faster, but as you go along the laps all seem to slow down. Having a bunch of different workouts to choose from makes it less boring and will give you the intensity you need to stress your body so that fitness or speed improves. Specificity of training is really quite simple; running on the track will not improve your swimming much. You must repeatedly do specifically what you want to be able to do. You need both anaerobic and aerobic exercise. If you never run, you won’t be capable of running. If you don’t swim fast in workouts, you can’t swim fast when you want to. If you don’t swim long workouts, you will be unable to swim long distances. A planned workout can be used to trick yourself into doing what you need. You don’t need someone in another lane to race against, you can race against the clock or yourself. to enhance performance and prevent injury. A warm up gives your body the time needed to redirect blood to the muscles you are using, loosen up those muscles and give your heart the time to get used to the increased demands you are putting on it. A warmup can help send synovial fluid to your joints to protect them. It can be as simple as a slow swim or walking before swimming and doing some stretching. The Main Set is the workout of the workout. See vocabulary below for parts/styles of the workout. You should also include a Cool Down (warm down, recovery swimming, active rest). This is usually easy to moderate swimming. It helps you get rid of excess lactic acid, reduce your heart rate and relax. Over distance refers to a long distance workout of moderate exertion with your heart rate staying in the low to middle level of your target range. In Fartlek (speed play), you vary speeds during a continuous swim. Imagine applying it to a ocean or lake triathlon swim. You might need to take off fast to get away from the crowd, then set yourself to a moderate speed. Going around a turn or passing another swimmer you might also want to speed up. Your ego may require a sprint at the finish. To be able to translate workouts your coach might write on a board on the deck, or that you can find online or in books, you need to understand swim workout shorthand. Most workouts will have numbers with multiplication symbols. An interval set, a series of swims repeating the same distance and amount of time allocated, is perhaps the most often used. Each should give you a brief rest period. They can be referred to as sets or intervals. 6 x 100 on 1:30 is an example. 1:30 is the amount of time you are (or your coach is) giving to do the swim. 1:30 means one minute, thirty seconds. Out loud it could be ‘six by 100 on one-thirty’. A coach using a time clock could say leave (start your swim) ‘on the bottom’ or ‘on the 30,’ as in when the second hand reaches the bottom of the clock face, or ‘on the top,’ ‘on zero’ or ‘on 60,’ … when the second hand reaches the top of the clock face. 100 is the number of yards or meters for the above swim. The De Anza pool is 25 yards wide by 50 meters long. For most swim classes the lane lines are put in along the width, so if you swam over and back (across to the other side and back) four times you would swim a 100. The 6 in the interval above means you should swim 100 (yards or meters) within one and a half minutes six times. If you could swim the above 100 yard intervals in 1:15 you would have 15 seconds to rest each time. A short rest period keeps your heart rate from dropping out of the zone you should be working at. If a group of people all do the same intervals, the people in better shape will get a longer rest each time. Swimmers who are just starting out on workouts or who have not been in the pool for awhile could be balking at this point, thinking they might never be able to swim that much, but don’t worry, you will build up strength and endurance as you try your workouts. Adjust them to fit times you can do, then, as you improve, make them a little more difficult. In a straight set, often used by distance swimmers, you swim at the same speed for each set. A specified amount of rest between two swims in a set is a Rest Interval. A set of 6 x 100 with a 0:15 rest interval means that a swimmer rests for fifteen seconds after each 100 regardless of how long he takes to swim the 100. Intervals/sets can be changed for differing effect, especially to trick yourself into working harder. To make yourself try to swim even faster you can use a negative split set, a descending set, build-up swim or broken swims. In a negative split set you try to swim the second half of each swim section faster than the first. For a 6 x 100 you would try to swim a 50 then a 50 faster for each of the 6 times. In a descending set you try to swim each section of the swim faster than the one before. For a 6 x 100 you would swim the first 100 moderately fast, the second 100 faster, the third faster than the one preceding, etc. For a build-up 100 yard swim, you start at a slow speed, gradually building to maximum or near-maximum speed at the end of each 100. Broken swims are timed swims that are faster than your racing speed with brief rests (about ten seconds) followed by a longer rest. You can also watch the pace clock and give yourself less time for each interval. To improve anaerobic ability, you need to swim quite fast (as compared to your steady swim speed, not as compared to another swimmers speed). Sprints are short swims at 100 percent effort, usually with a rest between them that allows your heart rate to get back to a resting rate. Repetitions uses swim sets of the same distance at close to maximum effort, up to 90%, followed by rest periods as long as or even longer than the swim time. Ladders and Pyramids can help make the workout more interesting, easier to remember and can be used to trick yourself into swimming a long distance without thinking about exactly how long it is. Using a ladder you either increase or decrease the distance of each swim portion, for example, swim a 25, brief rest, a 50, brief rest, then a 75, etc. Using a pyramid you go up then down in distance, a 25, 50, 100, 50, 25. A combo could have you increase the number of times you swim a distance as the length of swim gets shorter: 1 x 500, 2 X 400, 3 X 300, 4 X 200, and 5 X 100. A series of sets like these is also referred to as a cycle. When my swim coach in high school assigned a Fartlek negative split pyramid workout of (no stopping rests) 1x 25 freestyle slow, 1×25 fast, 1×50 slow, 1×50 fast, 1×100 slow, 1×100 fast, 1×200 slow, 1×200 fast, 1x 100 slow, 1×100 fast, 1×50 slow, 1×50 fast, 1 x 25 slow 1x 25 fast, I must admit that the center of the workout, the top of the pyramid, often did not find me swimming at different speeds with perfect technique. Repeat, Repetition or Rep is the word for a single swim in a set. A set 6 x 100 on 1:30 contains 6 reps of 100 yards or meters. Specific breathing patterns might be assigned to a workout. When most people start to learn freestyle they pick one side to turn their hear towards and get a breath. Bilateral breathing is breathing on alternate sides during freestyle (breathing every third arm pull), or breathing less often in a pattern of odd-numbered single arm strokes, such as fifth or seventh strokes. For many people bilateral breathing gives them the right amount of air for a long distance instead of breathing every two arms pulls and getting too much air, then switching to every fourth arm pull and feeling as if they don’t have enough air. Hypoxic training is a workout with a limited breathing and therefore a limited intake of oxygen. For example, 4×25 freestyle on 1:00 without breathing during the swimming portion of the set. 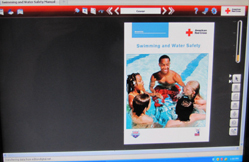 No hypoxic training or attempts at lengthy breath holding are allowed in my classes without permission and an instructor or lifeguard watching you. 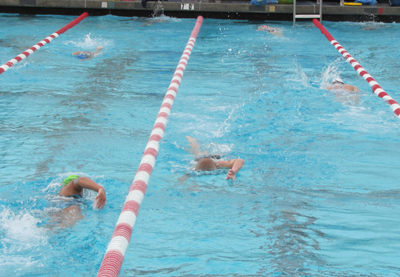 Specific skills practice can be a part of your workout, such as kicking only, pulling only using pullbuoys and maybe hand paddles, and various skills drills. Or you can do a drill for 50, and swim regularly for 50. Two strokes / arm pulls in freestyle or backstroke and one arm pull in fly and breast equals one stroke cycle. Pattern Repeating has you do a pattern of strokes or drills until you complete a given distance. 1x 400: 50 free / 25 back / 25 breast would have you swim 50 yards (or meters) of freestyle, 25 yards of backstroke and 25 yards of breaststroke until you have swum 400 yards. In this case it would mean you repeat the pattern four times. A common pattern repeat would have you swim a number of Individual Medleys (IM) of fly, back, breast, free. A Pull-Out is a strength building exercise of a push up at a different angle. You put your hands, palms down, on the gutter or pool deck and slowly push yourself up out of the water until your arms are straight. Let yourself down slowly and carefully trying to not hit your chin on the pool edge or gutter. If you do it in deep water do not cheat and use your toes on the wall to help or kick your legs. If you do it in shallow water you will need to bend your knees fully to get anything out of it. Even if you can’t do a full pullout at first you will get stronger muscles just by trying to. You can occasionally put one or more of these at the end of each set. Then you will be eventually strong enough to pull yourself out of the pool in one even motion, muscles rippling, instead of always using the ladder to get out of the pool. A lap on a track is one time around, but in a pool most people refer to a lap as once across the pool. Some coaches and swimmers refer to lengths to avoid confusion. Two lengths can also be referred to as down and back. A mile (5,280 feet) would be 70 1/2 widths of the De Anza pool, or 70 1/2 laps. A mile is also slang for a 1500 meter or 1650 yard freestyle race, both of which are not really a mile distance. “If you can talk and walk at the same time, you aren’t working too hard.” is one of the target heart rates at the site linked next, which also tells you how to compute and when to use your target heart rate. Ready to try a new workout? 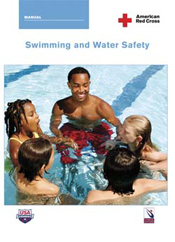 Swim classes FAQs includes links to swimming, diving and triathlon rules. The Navy Seal swim test, Naval Academy midshipmens test, a prerequisite for an “Escape from Alcatraz” 1-1/2 mile ocean swim and others are at: How can I tell if I’m a good swimmer?